“Most kids from my hometown either went straight to work or straight to college.” This may have been true for many students in Harrisville, Michigan, but Nikole Hampton wanted more after she graduated in 2008, so she decided to take a gap year between high school and college to attend high school in Sweden. “It was the best experience of my life and forever changed me for the better,” Nikole says of her year. She had been unsure of her future plans, but she was sure of one thing: she was looking for the adventure of a lifetime and she got it. “My parents were more in support of me going to college immediately, until they looked into gap year programs with me and realized that I was really motivated to do this. I deferred my acceptance to the University of Michigan, so they were happy to know I didn’t lose this opportunity either, and then they really started to support me.” Nikole got the best of both worlds with her gap year. She was able to take a giant leap out of her comfort zone and find out what she was made of, then attend college the following year. 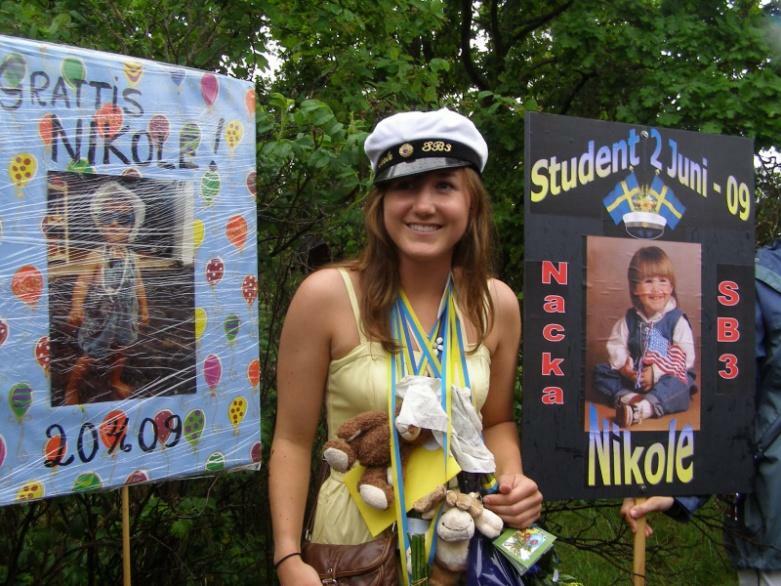 Nikole lived with a host family outside of Stockholm and attended Nacka Gymnasium as a third year (or a senior). In Sweden, students attend school until they are around 19 years old, which meant that her classmates were the same age, which was very important to Nikole. Despite the fact that she was the same age as most of her classmates, Swedish school took some getting used to. “Swedish high school is set up more like American colleges, with weekly schedules and classes that met twice per week. We also had the majority of classes with our ‘class,’ or about 20-30 students studying the same track. Mine was social science and art, so that is what my classes were mostly about except for our electives.” Her classmates quickly became her closest friends. “We were like a family!” She also made friends with kids on her track team and became close with her host sister who often invited her to hang out with her friends even though they went to different schools. Nikole took a risk and challenged herself and it paid off immensely. She learned a new language, made incredible friends, even ate reindeer! Now, she is finishing up a bachelor’s degree in social work at the University of Michigan. As a graduation present to herself, she is traveling back to Sweden this summer to visit her friends and host family, that she hasn’t seen in four years, to relive all of the wonderful memories she had there. This experience for her was unforgettable and transformative. She came back from Sweden motivated, confident and ready to continue with the ideas that ignited her passion for social issues while abroad.